Name this NEW bed design... Follow us on Twitter. 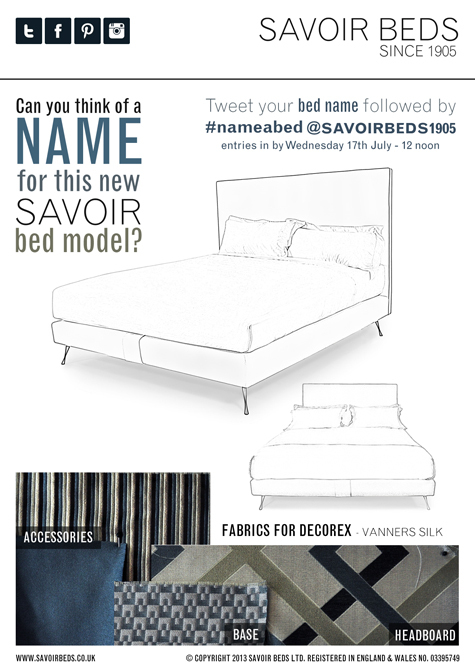 The winner will get the chance to see the bed on display at Decorex and receive a bottle of bubbly! This design of this bed is looking perfect for the people and it is good for the bones of the people. I am impressed that this company tries to make the unique bad for the people and care about the people. Thank you for your hard working for the people. What are the best mattress for a patient of lower back pain like me? My physician suggested me to use firm mattress for sleeping purpose that's why the top assignment services by which the people would like to use.